Fox International Productions’ first locally produced film was finally unveiled on Tuesday, featuring Park Chan-wook’s “Sympathy for Mr. Vengeance” star Shin Ha-gyun in the lead. The upcoming film, titled “Running Man,” tells the story of a father (played by Shin) who is wrongfully accused of murdering a cab passenger and soon becomes a wanted criminal. While being chased by the police and the press on Seoul streets, he desperately tries to clear his name and reunite with his 17-year-old son (played by Lee Min-ho). 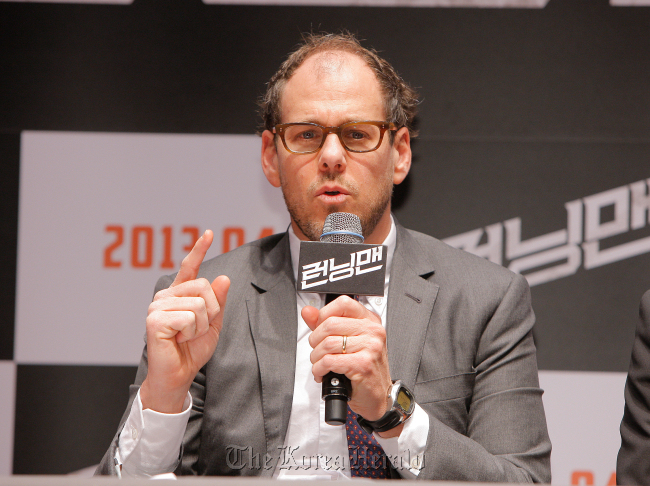 “We were very impressed with the concept of trying to make a film that would be pushing the action portion, all done in a realistic way within Seoul itself,” said FIP president Sanford Panitch during a press conference in Seoul on Tuesday, when asked about why the company chose the action flick to be their first Korean project. The release of “Running Man” comes three years after FIP’s investment in director Na Hong-jin’s thriller “The Yellow Sea” in 2010. According to Panitch, FIP has invested in over 50 local language films in 11 different countries, including Japan, Spain, Russia, India, Brazil and Taiwan. The company’s 2011 Mexican film “Miss Bala” was selected as the Mexican entry for the Best Foreign Language Film at the 84th Academy Awards, though did not make the final shortlist. Its 2011 German project “What a Man” also enjoyed box office success, while receiving positive reviews from local critics. Panitch said the company’s primary goal was to attract many local viewers. “For Fox, being a worldwide distributor, we want the film to be most successful in Korea where it is set in the language it is spoken and where it needs to be the most successful,” he said. Panitch said it wasn’t until the international release of Park Chan-wook’s 2003 film “Oldboy” that triggered many in Hollywood, including himself, to turn their eyes to Korean films; the thriller had the aesthetics and the kind of storytelling that many in the U.S. had not seen before, he said. He also mentioned Bong Jun-ho’s “The Host” (2006) and Kim Jee-woon’s “The Good, the Bad, the Weird” (2008), when talking about the unique talent in Korean cinema. Both Bong and Kim, along with Park Chan-wook, are making their Hollywood debuts this year. “I don’t think you can be a film executive today...not being able to have a history of seeing Korean films,” he said. “Running Man” also received funding from the Korean Film Council’s “location incentive” program, which supports part of the cost of foreign feature films and TV drama series shot in Korea. The film is slated to be released in local theaters in April.